It may sound strange to recommend malls for children, but most of Bangkok’s malls and shopping centers have an abundance of activities for children of all ages. They also have the benefit of being air-conditioned too, helping everyone to stay cool in the hot and humid capital. Some kids may enjoy spending some time having a mooch around the different shops … especially if they are getting a treat or two! There is a good selection of places to eat and drink in all the malls, and many have very reasonably priced food courts with a wide selection of traditional dishes. Most shopping centers have, as a minimum, a children’s play area. Siam Paragon is home to one of the biggest aquariums in South East Asia. The whole family can gaze at an interesting and colorful array of aquatic life. There is also Kidzania, a mini world where you can safely leave your kids having fun while you shop. It is both educational and fun, and your children can enjoy the company of other youngsters as they play at a wide range of different professions, wander around the village, and try many different activities, all under expert supervision. There’s also a cinema and bowling alley if you want to make a day of it. One of the best malls which have a huge ice skating rink and a fantastic Madame Tussauds Wax Museum. Innovative and interactive, the Bangkok Madame Tussauds allows visitors to get really close to the models, posing for pictures hugging and shaking hands with celebrities, sitting in Barrack Obama’s chair, and even standing next to the English Queen! The Mall has a large entertainment zone and a roof-top water park! There are pools, rides, slides, and shows all overlooking the hustle and bustle of Bangkok, whilst indoors you’ll find a great cartoon village, a pretty indoor waterfall, and a cinema. The good old MBK mall has a large entertainment center. Activities include bowling, karaoke, computer games, play areas, and a cinema. This huge mall is great for both lively and shy kids. If your child craves a little downtime, take them to the library where they can bury themselves in a great book for a while. There’s also a small sightseeing train that is usually a hit with kids of all ages. An ice skating rink and play area are perfect for letting off steam, and the cinema shows a great selection of family-friendly films. Central Childlom is home to an enormous play area called Central Friendly Land. It is better suited for younger kids. It gives you a chance to catch your breath and have a breather as your children run and play with other kids and do a number of supervised activities. Future Park is one of the biggest shopping areas in Asia. Indoor and outdoor play areas offer the best of both world, and there’s also a cinema and a bowling alley. For restless kids the private rooms are ideal – pop on a favorite movie or a new release and kids can move around and chatter to their heart’s content at the same time as enjoying the film. You could even enjoy a typically Asian pastime and sing some karaoke together! The malls are a massive part of the Bangkok lifestyle, so you needn’t feel like you’re missing out on the local culture! Everyone can find something to keep them happy in cool air-conditioned comfort. 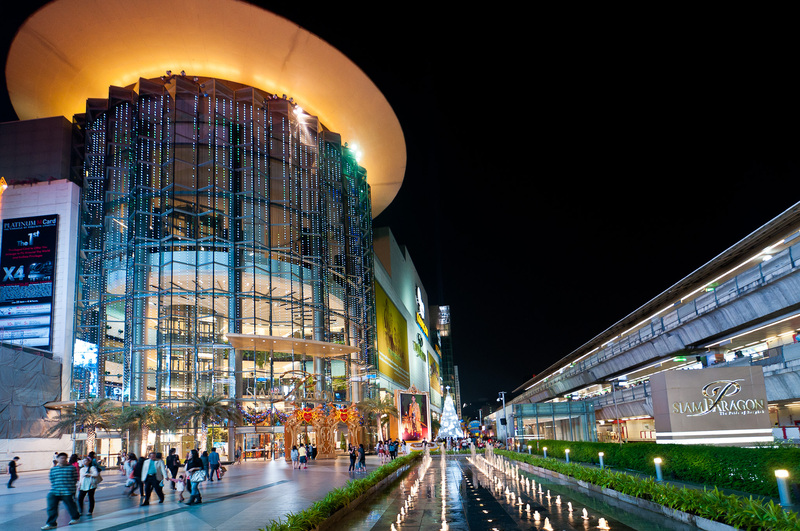 Enjoy Bangkok’s Malls and Shopping Centres.